The writer and military historian Hau Tuoc Nguyen Phuoc Minh Kien CDA is Honoured with the award of Knight Commander of The Imperial Order of the Dragon of Annam, for services to the Imperial Nguyen Family. Hau Tuoc Nguyen Phuoc Minh Kien CDA is a well known and established writer in New Zealandand has been involved in many publications regarding the history and wars of Vietnam. His book "The Vietnam Scrapbook -The Second ANZAC Adventure" was the first history book published on the New Zealand involvement in the Vietnam conflict, and is today a National Reference work. Hau Tuoc Nguyen Phuoc Minh Kien CDA has also been Honoured by the American Vietnam Veterans Association with the honourary award of their Distingushed Service Medal. Hau Tuoc Nguyen Phuoc Minh Kien CDA, history book being placed at the Vietnam War Memorial Wall, by the New Zealand High Commissioner and his wife. 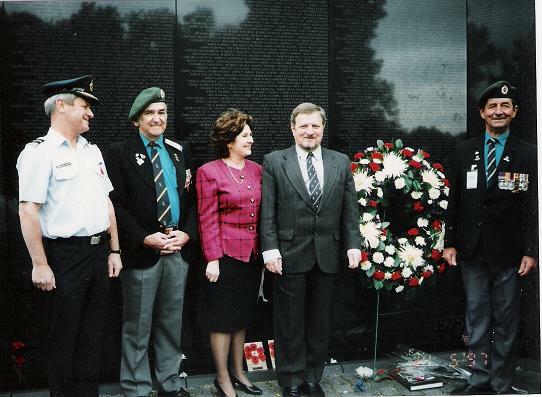 They are flanked by the President and Vice-President of the New Zealand Vietnam Veterans Association. (The book lies directly beneath the wreath). Washington DC 1997. Commander Thanh has for many years served the Imperial Family in a variety of tasks and appointments. Ba Tuoc Hien Tai Nguyen Thanh Liem is honored by The Imperial Nguyen Family with the decoration of Knight Commander of The Imperial Order of the Dragon of Annam, for services to the Imperial Nguyen Family. Commander Thanh Ingalls has for many years served the Imperial Family in a variety of tasks and appointments. Ba Tuoc Dr. Nguyen Phuc Do Kim DDS is honoured by The Imperial Nguyen Family with the decoration of Knight Commander of The Imperial Order of the Dragon of Annam, for services to the Imperial Nguyen Family. Nam Tuoc Nguyen Phuoc Trung Chinh CDA is honoured by The Imperial Nguyen Family with the decoration of Knight Commander of The Imperial Order of the Dragon of Annam, for services to the Imperial Nguyen Family. Commander Trung Chinh has for many years served the Imperial Family as their webmaster as well as variety of other tasks and appointments. 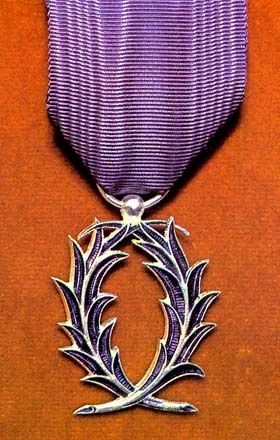 bestowal as a Chevalier dans l'Ordre des Palmes Académiques (Knight of the French Order of Academic Palms).